What could anyone possibly say about Chanel No.5 that hasn’t already been said ten times over? So all that remains to be said is to share my experience like anyone else would have to do at this point. Simply put, No.5 is the perfume people think of when they hear the word, “Perfume”. It’s misunderstood, well-loved, adored, respected, hated, revered, confusing, complex, and familiar. Any fragrance lover worth his or her salt knows what Chanel No.5 smells like. In Bottle: Loud sparkling aldehydes and florals. Heady but clean and vivid in the sense that the fragrance is immediately recognizable. Chanel No.5 was not meant to be contained to a blotter though. It’s a fragrance that demands wearing. Applied: Freshness from citrus and aldehydes. There are some fragrances that overdo the citrus but No.5’s initial citrus is tame. It smells very necessary as the scent settles down giving off aldehydes and florals. I can smell the ylang-ylang, the rose, and jasmine. The aldehydes are giving this a very clean, crisp feel. There’s something slightly dry about this, like desert air, as the fragrance starts to age and the florals are joined by powder and this dry airiness. No.5 is not for the lighthearted. It lasts and lasts and will continue to last for hours while it has trouble settling between floral, dryness and floral, powder. The final dry down of this scent may very well happen late into the night if you applied this in the morning. It’s fade loses most of the aldehydes and gives way a clean, sandalwoodsy, musk. Extra: Chanel No.5 was released in 1921 when it became the raging success it is today. Hundreds of stories surround the creation of Chanel No.5, even more about who wore it and why. There are fan clubs dedicated to No.5, people who have written songs featuring No.5, and people who go their entire lives wearing No.5. Even through its various reformulations, Chanel No.5 has kept its core personality as a classic. Design: Iconic perfume bottle for the eau de parfum version. Rectangular glass with Chanel No.5 label set in the middle. The cap is a heavier, nicer material that snaps onto the top to protect the sprayer that distributes an even, fine mist. There is a small Chanel logo running along the band on the cap. The juice itself is a dark yellow amber color. Notes: Ylang-Ylang, neroli, aldehydes, jasmine, mayrose, sandalwood, vetiver. Chanel No.5 is probably the fragrance most accused of smelling like “old lady”. While everyone’s perceptions of old lady smell is different, No.5 to me, is way too fresh, way too sparkling to be an old lady smell. But neroli and powder are the two marks of an old lady fragrance and I cannot deny that it has a certain feel to it that excludes it from being young. 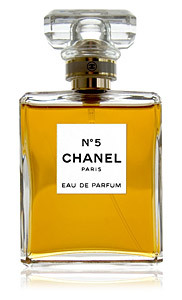 Reviewed in This Post: Chanel No.5, 2009, Eau de Parfum. This entry was posted in chanel, classic, floral, Reviews By House and tagged aldehydes, chanel, classic, floral, fragrance, no5, perfume, review, smell. Bookmark the permalink. ← Will Rubbing Your Wrists Crush Perfume? and Blog”. I actuallymight definitely be returning for even more reading through and commenting here soon. No problem, Ardis. Thanks for dropping by.